If you’re a Pitt student, looking at your school’s academic calendar is never fun. Your eyes scan the page filled with dates, head hung in despair as you realize Pitt has perhaps the skimpiest breaks of any university out there — including finals preparation, offering students one measly reading day. Falling in line with its theme of cramming semesters into as tiny a window as possible, Pitt offers students very few opportunities to catch up on their studies, instead throwing them into finals only three days after their last day of class. And many students would rightly argue that Saturday should not count as a University-sanctioned study day, since very few students have class on the weekends anyway. Even our nextdoor neighbor, Carnegie Mellon University — notorious for its massive workload and high pressure environment — spreads finals out over two weeks, giving its students two weekends and an additional weekday to study for exams. Plenty of other elite universities offer reading periods too, with the best of them all — Harvard, Princeton and Yale — giving their students a full week to finish papers, study for exams and relax before the most stressful week of the semester. According to Shira Moolten, a first-year at Princeton, jumping right into finals without additional study time would leave material from her classes completely jumbled together. “Reading period is really useful for me because I can focus on each test individually without having to worry about other classwork,” she said. If the most elite students in the country need a reading period to perform well on their finals, surely Pitt students would benefit from the same. Having a reading period at Pitt might mean extending Pitt’s current school year, which currently ends in late April. But this isn’t necessarily a bad thing. Because Pitt lets out for the summer about two weeks earlier than the average school, students supposedly have an advantage when applying for internships because they can start working earlier. But most summer internships begin in mid- to late May — and most large companies won’t adjust their regimented schedule to cater to one or two students who happen to finish school early. So instead of getting a head start on other interns by starting work early, most Pitt students must sit idly for a couple weeks as they wait to begin internships — weeks that would be much better spent relaxing and studying before finals. While finishing school in April benefits study abroad students — the longer summer gives them more flexibility to participate in summer programs — Pitt shouldn’t build their academic calendar around 17 percent of the student body just to avoid extending the school year. In fact, including a reading period before finals wouldn’t necessarily involve a significant change to the academic calendar. The beauty of reading periods is that they’re extremely flexible in length — which vary across universities. The Daily Pennsylvanian — the University of Pennsylvania’s student newspaper — published a 2016 article where students decried UPenn’s two-day reading period, which is short compared to many other universities. While two days might sound skimpy to students at other universities, it would make a big difference to students at Pitt — and shutting down class the Thursday and Friday before finals weeks wouldn’t drastically affect the school calendar, either. The benefits of reading periods are evident — cramming all studying into a small weekend window is an extremely ineffective way of absorbing information. Students need time to relax and prepare thoroughly if they want to perform well on final exams. And even if they do manage to perform well after cramming, that comes at the expense of their mental and physical well-being. Allowing students flexible schedules gives them the ability to manage their time and study without struggling through a full week of classes. A reading period is not only about academic preparation, either. Filling an entire week — or even a few days — purely with schoolwork would be drollery. Destressing is proven to help exam performance, and students can use their extra time exploring Oakland, relaxing with friends or doing other recreational or leisurely activities. 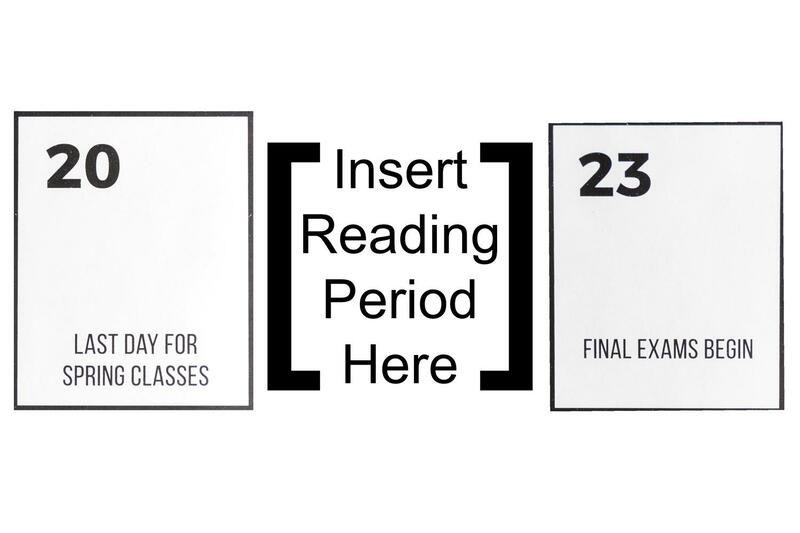 Regardless of how long students think Pitt’s reading period should be, they should be unsatisfied with the with the near non-existent one we have now — especially since many other schools give students up to a week of extra study time. Universities aren’t just places for learning, they’re institutions of sustainable learning — administrators need to ensure their policies aren’t contributing to unhealthily high stress levels among students. And they could take a major step toward ensuring that by adding a reading period before finals.